ASUM Outreach is proud to continue their support of education and research in developing nations by offering 5 travel grants for those looking to participate in WFUMB. The travel scholarship will support 5 individuals, to the value of $2000 AUD, to travel to Melbourne, Australia in order to participate in the WFUMB Congress, 6-9 September 2019. Eligibility and qualifying criteria apply. Qualifying criteria includes the submission of an abstract. Applications close Friday 1 March 2019. Early bird registrations are open for this premier event on the 2019 international ultrasound industry calendar. Join over 2,000 of your ultrasound peers at the World Congress for Ultrasound; to exchange ideas, share experiences and interact with world renowned professionals. Register now and save up to 18% with Early Bird registration, get in now to save on your ticket. Christian Nolsøe, WFUMB President invites ultrasound friends from all over the world to join this “must-attend” event in ultrasound. 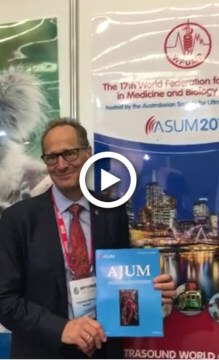 WFUMB 2019, Melbourne, Australia, 6-9 September 2019. Hear why Christian Nolsøe invites you to join the World Congress for Ultrasound.